The Viking Kingdom of York is a misnomer really. The territory in the north of England which was captured by the Vikings should be known as the Kingdom of Viking Northumbria. At the demise of Anglian Northumbria, when rival monarchs Ælle and Osberht were both killed at the Battle of York, the Vikings installed a puppet – Egbert I. 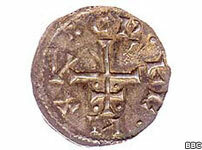 He was deposed in 872 and King Ricsige was installed. One assumes the Vikings still had overall control, as Halfdan ('Wide Embrace') I, the first Viking king of 'York' didn't die until 877 (or 876 according to some sources). An interregnum followed between 877–883, after which the Viking kingship continued. In 876, one Egbert II is mentioned, and it was at his death that 'York' absorbed Anglian Northumbria. One wonders how much power these latter two kings held. Although there remained a rump of Northumbria under Anglo-Saxon control, this approximated to the old Anglian kingdom of Bernicia, and it had lost its kingship by 900. It must be stated that at the Convention of Eamont (927), at which King Athelstan received homage from several kings, Ealdred of Bamburgh is referred to as a 'sub-king'. He and his father, Eadwulf, (who died in 913) mention themselves as being at Bamburgh, ruling as 'Northumbria'. In 954, Osulf is called 'Lord of Bamburgh', subject to the English King. After this, Bamburgh seems to have been ruled by earls, and the term 'sub-king' disappears. One may assume, therefore, that ancient Bernicia (with its capital at Bamburgh) had re-established itself as 'Northumbria'. 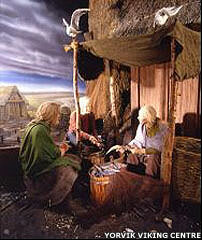 In truth, the remainder of the English in the north formed the so-called Viking Kingdom of York. As to borders, the Viking Kingdom of Northumbria corresponds to the ancient kingdoms of Deira and Elmet. The Convention of Eamont (near Penrith) in 927, is said to have taken place near the border of Strathclyde and 'The Kingdom of York'. By the 880s Northumbria had ceased to exist as a single political and cultural province. The most important fracture was between the ancient kingdoms of Bernicia (Anglo-Saxon) and Deira (Viking). Both were east of the Pennines but both retained territory in the western Pennines, with central and southern Lancashire being an integral part of the Kingdom of 'York' (Viking Northumbria). "Halfdan shared out the land of the Northumbrians, and they proceeded to plough and support themselves." When Halfdan I took the region, he based himself at Tynemouth, where he could marshal both his army and fleet. He originally imposed his rule on Bernicia as well, and also raided Strathclyde. In 876: "Halfdan shared out the land of the Northumbrians, and they proceeded to plough and support themselves." (Anglo Saxon Chronicle). However, it is unlikely that Halfdan would have 'rewarded' his men by effectively turning them into yokels. This text would appear to Saxon propaganda. One assumes that at the deposing and subsequent death of Halfdan, Bernicia established itself as an independent Anglo-Saxon Northumbria, and at some point York became the capital of the Viking Territory. 867 Egbert I Deposed in 872 and banished, along with Bishop Wulfhere. 872 - 873 Ricsige Dependent upon the Danes. 876 Was Egbert II a resurgent Northumbrian king, wresting control of Bernicia from the Vikings? – The predecessor of King Eadwulf (died 908) and King Ealdred of Bamburgh – or was he another monarch dependent upon the Viking overlord? At Egbert's death, Anglian Northumbria was absorbed into the Viking territory, until it emerged as independent Bamburgh, subject to the English king. The earls of Bamburgh followed. 875 - 877? Halfdan I ('Wide Embrace') Died probably at the Battle of Strangford Lock, trying to regain Dublin. 900 Æthelwald Son of Edward the Elder, driven from Wessex and took refuge in York where the Danes received him as king. 905 Halfdan II Brothers and co-rulers – killed by the invading Saxon army. 947 Eirikr ('Bloodaxe') Danish dynasty again. 949 Olaf/Anlaf II 'Cauaran' Sihtricsson Restored. 952 ? Dublin-based claimant, briefly recognised. 954 Edred of England Effective end of Viking Northumbria.